Lying on a large bay, at the foot of the ‘Sierra Maestra’ mountains, Santiago de Cuba is a city full of history, with a castle overlooking the bay which dates back to Cuba’s earliest Hispanic colonial past. As Cuba’s second largest city, Santiago is large enough to be interesting, yet at the same time has a very ‘provincial’, relaxed feel to it. People are friendly and more than willing to stop and talk to visitors. 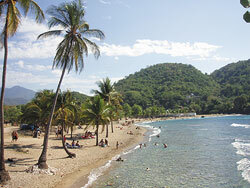 The centre of Santiago has beautiful colonial style buildings and the nearby beaches are spectacular. Santiago is not a tourist resort, but a typically Cuban city, an ideal location in which to learn Spanish and discover the real Cuba. Students on our Spanish courses in Santiago de Cuba have their lessons in their teacher’s home, learning Spanish in a class of a maximum of 3 students. Alternatively, the teacher may come to the Cuban host family where you are staying, for the Spanish lessons to take place there, again with a maximum of 3 students per class. You can learn Spanish on a Mini-Group course (maximum of 3 students/class) of 20 lessons/week, or if you want to learn as much Spanish as possible during your course in Santiago de Cuba, have 20 to 30 private lessons/week. There is also an optional Salsa course and Guitar course. If you like, you can take one of the ‘Combined Courses’ which are a combination of the Mini-Group Course and 5 or 10 private lessons/week. 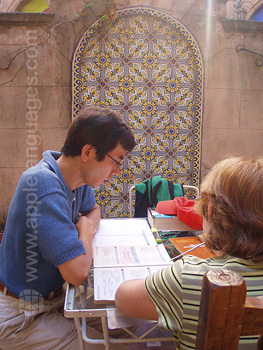 The local Spanish language course organizer arranges accommodation in carefully selected Cuban host families. 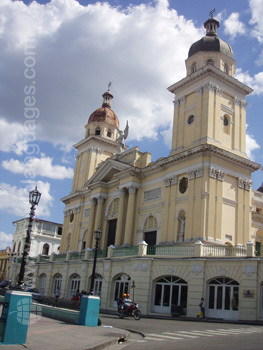 All accommodation is within walking distance of the historic centre of Santiago de Cuba. Staying in Cuban host families helps student to learn Spanish as quickly as possible, as the families speak Spanish to the students. 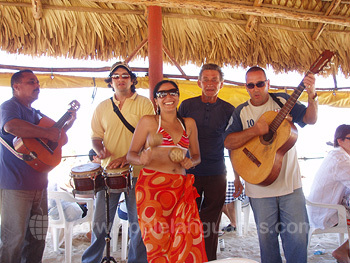 It also enables you to meet and quickly get to know the friendly local Cubans. The welcoming, friendly nature of the Cuban people is what makes Cuba so special. We can arrange shared room accommodation for students travelling with a friend or relative. A cultural program is also available, with guided tours of Santiago de Cuba, visits to a rum museum, Salsa and Mumba dance lessons, guitar lessons, visits to nearby beaches, as well as trips to local sites where important events took place during the Cuban revolution. This program ensures that students enjoy their time in Santiago de Cuba, as well as helping them practice out of class the Spanish that they learn at our school and come to a better understanding of the Cuban people. To get to Santiago de Cuba, many students fly to Havana. We advise you to arrive in Havana on a Saturday. 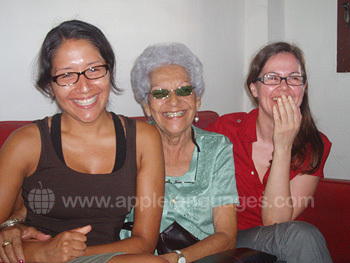 We can arrange overnight host family accommodation for you in Havana. You should then take, on Sunday, a local Cubana Airlines flight to Santiago de Cuba, purchasing the ticket in Havana Airport. Please contact us if you have any questions. Average score for our school in Santiago de Cuba based on 9 previous client reviews. The classes (at a private home) offered by an experienced teacher were excellent. The combination of classes, accommodation, and half-board is great, particularly in a country such as Cuba. The teacher was excellent. She provided good conversation practice and grammar explanation. She also provided a wealth of information on Cuban history, customs and culture. She is a very friendly lady and the time passed very quickly with no boredom. The accommodation was very good with excellent breakfasts and dinners. It was within 5 minutes walk of my teacher's house and 20 minutes from town. I really appreciated that the course was in the same house of the teacher because I felt part of a family. This friendly atmosphere helped to improve my knowledge of the language through association with concrete moments and situations. Moreover I could better understand and appreciate the Cuban culture. The my room and all house were very nice. I was received and I have been always treated in very warm way. I hope that other students will choose to go to study Spanish in Santiago de Cuba because they will live an enriching experience hard to forget. The salsa teacher as well is very professional and nice! This was an excellent experience. My instructor was a retired university Spanish teacher with 40 years of experience. I made significant progress in my ability to communicate in Spanish. Living in the community meant that I had a full immersion experience. My accommodation was very nice. Excellent home cooked healthy food in a central location with many opportunities to practice at the breakfast/dinner table. My host was very attentive to all needs. Great adventure. Great experience. Great learning. Additional opportunities included participating in the massive community festival held every weekend on the main street of the city (noches santiageros),dance lessons, incredible music clubs at night, visit to a farm and horse riding in the country. Living in Santiago de Cuba is an experience not to be missed! Thank you.